Yvette Harrington has joined the clinic as the new Hospital Manager. Yvette has a background in art and biology with almost a decade in preclinical CRO work (rats and mice), starting in the lab and working her way up to the business side of the company. In addition, Yvette ran a small clinical lab for niche virology testing for several years and worked as a Project Manager for a pharmaceutical manufacturing company. Yvette enjoys reading, puzzles, and spending time with her husband, son and 2 cats, Boba and Sky. Briana has been working with animals for over 15 years. 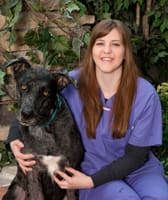 She has been with the clinic since 2012 and is the Lead Veterinary Technician. 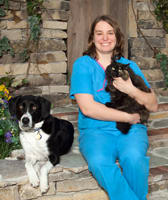 She finds the veterinary field very rewarding and loves playing with her rescue dogs and cat. Erin has been around animals her entire life, showing horses and sheep in 4-H. Erin and her husband enjoy taking care of their dog, cat, and 3 horses. 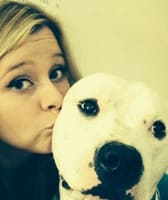 She started working at Thiensville-Mequon Small Animal Clinic as a kennel attendant in 2006, moving to a Technician position in 2008. 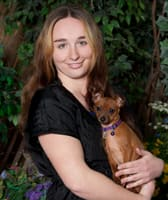 Erin graduated from Madison College in 2013 and is now a Certified Veterinary Technician. 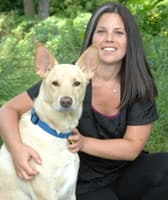 Amie started her career at Thiensville-Mequon Small Animal Clinic as a kennel attendant while she was in high school in 2002 and quickly became a technician after graduation. Amie left in 2007 and gained experience at an emergency veterinary clinic and veterinary internal medicine specialists. Amie went to school to obtain her phlebotomy and EMT certification, and then rejoined our clinic in 2015. 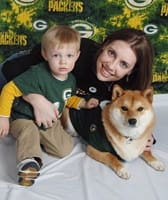 Amie shares her home with her son Logan, her senior Shiba Inu Sylius, and two adopted cats Ruckus and Rufio. 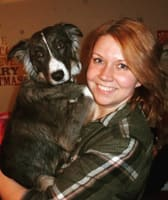 Cass joined the clinic as a student in 2016 after completing the veterinary assistant program at Milwaukee Career College and she was hired on as a technician after her 6-week internship. 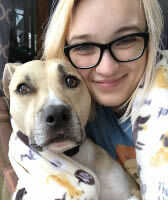 When she is not at work, she is with her pit bull, Mojo, and taking him on as many adventures as she can with her fiancé. Cass plans on studying hard and becoming a certified technician in the future. 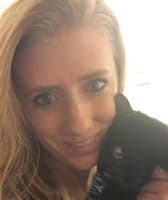 Amanda’s life long passion for animals has prompted her to further her education in the veterinary field. She is currently studying to obtain her Certified Veterinary Technician degree from Penn Foster University. She started her veterinary technician career after fulfilling an internship here at TMSAC. 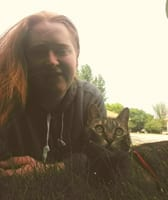 Amanda is originally from Cedarburg though she now lives in Grafton with her adopted two-year-old cat, Muenster. Sarah has had a passion for the veterinary world since she was in third grade. She volunteered at the humane society, worked at a doggy daycare, and has been part of our clinic since December 2014. She is a part-time veterinary technician and is the Lead CSR. When she is not at the clinic, she spends time with her Goldendoodle, Rupert, and husband at home in Trenton, WI. Jim has been raising and caring for animals his entire life. He joined the team here in 1996. 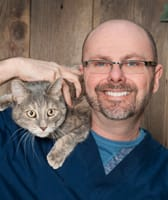 He currently lives with his cat Rascal, and dog Callie in Cedarburg, but also welcomes other animals for pet-sitting in his home. Kim has always had a passion for animal care. She has had horses, cats, dogs and other small animals in her life. She graduated with a degree in Animal Biology from UWGB, and then went on to become a zookeeper in Green Bay for three years. Kim joined our clinic in April of 2016 and spends her free time with her husband, her dog Niko, and two cats Otis and Lynx. Morgan is a Wisconsin native, a Grafton High School graduate, and has been a part of the Ozaukee County community since she was three years old. After high school, she attended Vici Beauty School and graduated with her Cosmetology license in 2014. After four years in the beauty industry, she left her career in Cosmetology to pursue a new adventure following her passion of animals. In her free time, Morgan enjoys exploring new places with her Border Collie, listening to live music, and kickboxing. Nicole has enjoyed animals her entire life. From rodents, to reptiles, to amphibians, to the classic furry family members; she loves them all. Nicole joined the clinic in the summer of 2018 as a part-time CSR and has been loving every minute of it. She hopes to do more hands-on animal care in the future as well as have her own hobby farm. Nicole also works full-time as a Sous Chef at a local senior living community. When Nicole isn't working, she enjoys relaxing with her husband and their 4 rescued cats: Ginger, Coco, Gram, and Chunk. 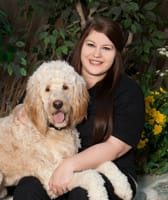 Amy joined our team in April of 2011 in our kennel department and currently in our grooming department. 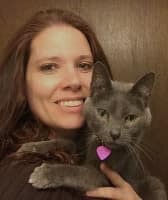 Amy has experience working with animals through a small hobby farm, animal classes in high school, volunteer work at the Washington County Humane Society, and having dogs and chickens at home. 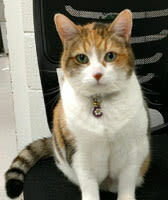 Amy dedicates her time to making both dogs and cats look great and having fun doing so. Charna has been an animal lover all her life. While her background is in engineering, her passion is animal care and grooming. Charna has been training and grooming dogs for over a decade. Charna enjoys staying active, being outside and networking with animal rescues around the county. Hello! 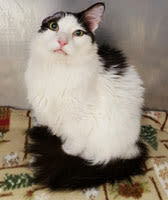 My name is Hansel; I have been living at Thiensville-Mequon for about 8 months now and I LOOOOOOVEE it! I won the hearts of my coworkers by giving them lots of hugs and with my adorable personality. When I came to the clinic, I had a bad ear hematoma and an infection. Dr. Mitchell did her very best to heal my ear and get rid of my infection, but unfortunately it did not work so now I look a little different since I only have one ear. Having one ear doesn’t slow me down much though; along with looking even more handsome, I can still hear normally and I love love love to play. You’ll see me hanging out with my front staff most of the time and keeping them on task, unless I am doing something rather adorable, then I require everyone’s full attention. Feel free to give me as much attention as possible when you and your pet come to visit! Hello! My name is Gretel; I have been living at Thiensville-Mequon for a year. You do not see me very often because I am terrified of the printer and all the loud noises in the front reception area. I like to have my alone time in my various hiding spots throughout the treatment area, but I also like to supervise my technicians and make sure they do everything correctly. When I came to the clinic, I was pretty sick. I had to have a feeding tube put in and the technicians fed me that way until I was healthy enough to eat on my own; since then I have become kind of a pig. I really love to eat and will always accept treats and extra meals. I like to frequent the counters in the treatment area, hoping and praying food gets left out or the cheese whiz containers get left open so I can sneak a few licks.